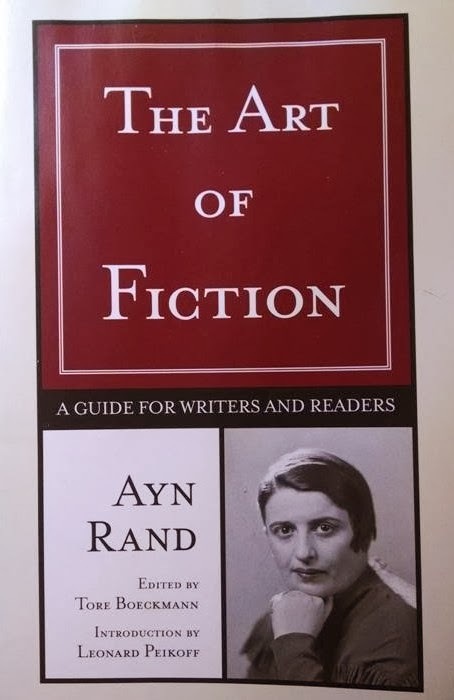 Choosing to read either Ayn Rand's The Art of Nonfiction or The Art of Fiction is tricky. The Art of Nonfiction relies greatly on fiction passages, notably Rand's, to illustrate process, substance, structure, and style; nevertheless, it renders many profound insights about the writer's task. (Read my review of Rand's The Art of Nonfiction in this blog.) On the other hand, writers looking for inspiration and encouragement from a consummate professional will find it in abundance in The Art of Fiction. Many of the points I made in The Art of Nonfiction applies to this book. For instance, Rand is extremely fond of herself as an exemplar of great literature. She writes, "In regard to precision of language, I think I myself am the best writer today." She is equally unforgiving of other writers, especially Sinclair Lewis. Once again, it's fair to say that Rand's two books, published posthumously, come from lectures that she delivered in her home exclusively to friends, so she never intended to publish them. But you can't argue with quality. Early in the book, Rand offers a simple admonishment to would-be writers: "If a writer feels that he was unable fully to express what he wanted to express, it means that he did not know clearly what he wanted to express. ... That which you know clearly you can find the words for and you will express clearly." From there, she delves into Victor Hugo, Isak Dinesen, Mickey Spillane, and Thomas Wolfe, among others, to reflect on the do's and don'ts of style. In The Art of Fiction, Rand takes a refreshingly pragmatic and helpful approach to many writing topics. About the writer's muse, she notes, "If you keep on storing things in your mind for your future writing and keep integrating your choice of theme to your general knowledge, allowing the scope of writing to grow and your knowledge widens, then you will always have something to say, and you will find ever better ways to say it." Her strong opinions lead to uncompromising propositions, such as "The purpose of all art is the objectification of values." Rand unflinchingly leaves herself open to criticism from literary theorists. Those who favor character as the premier element of fiction would find arguable her position, "The most important element of a novel is plot." Also, her division of style into the two categories of content and diction might puzzle those who argue that style is the sum of syntax and diction. Coincidence is always bad in writing, and it is disastrous in plot writing. ... it is to be avoided at all costs. Learn to think in terms of conflict. If the essential situation ... can be told in one sentence, this makes for a good plot story. Your characterization will never be better than your power of observation. One of the beauties of a good literary style ... is that it combines clear denotation with the skillful use of connotation. The purpose of metaphors, or comparison, is epistemological. A symbol should be legible; otherwise, the form is a contradiction in terms. Fiction writers and students will find far more in this book than they would likely get in a semester-long writing class, unless they were lucky enough to attend Rand's lectures. Four Elements of an Audit Point—Really? 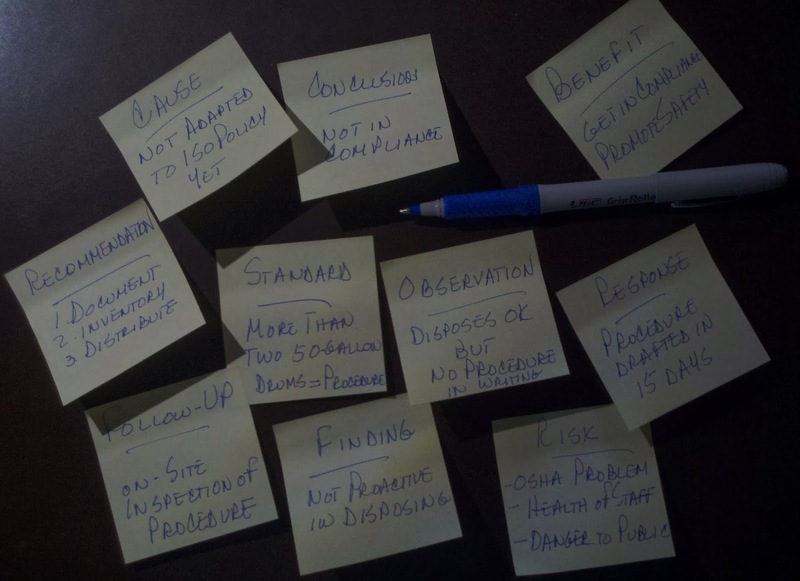 criteria — By what standards is the auditor assessing the situation? condition — What is the situation? cause — Why does the condition occur? effect — To what risk does the condition expose the auditee? XYZ Corporation should pay invoices within 30 days of the invoice date (criterion). XYZ pays invoices on average 45 days after the invoice date (condition) at the direction of management (cause). This delinquency could lead to poor vendor relations and subject XYZ to costly, time-consuming litigation (effect). method — How did the auditor determine the condition? limitation — What prevented the auditor from conducting a more thorough assessment? finding — How would the auditor summarize the condition? recommendation — What should the auditee do about the condition? follow-up — How will the auditor address this finding in a future audit? We examined a random sampling of 400 invoices and disbursements of the 1,975 total transactions (20.3%) of XYZ's West Coast office for the period January 15, 2014 to February 14, 2014 (method). Given the two-day audit schedule, we were unable to review a larger sampling or a longer period, and we did not review XYZ's East Coast office at all (limitation). Our review shows that XYZ's West Coast office's Account Payable Department is delinquent in disbursing funds (finding). XYZ should pay invoices within 30 days of the invoice date (criteria). In the sample, XYZ paid invoices on average 45 days after the invoice date (condition) at the direction of management (cause). This delinquency could lead to poor vendor relations and subject XYZ to costly, time-consuming litigation (effect). XYZ management should develop a mitigation plan to pay invoices within the contractually committed period and present it to the auditor within 30 days of this report (recommendation). In 90 days, we will return to XYZ to audit Accounts Payable disbursements for this criterion (follow-up). The seasoned auditor would rightly say that even more elements exist (e.g., auditee response, aberrations, benefits), so less experienced auditors must understand that the four-element template is there just as a jumpstart, not as a complete formula. 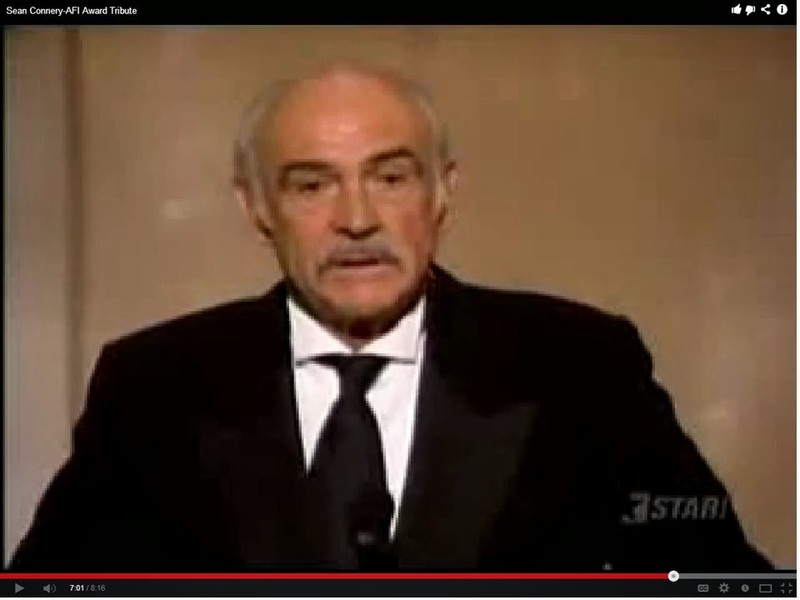 I urge you to view this video of Sean Connery accepting the 2006 American Film Institute Lifetime Achievement Award. Since the video is 8 minutes and 16 seconds, the part to watch is a 40-second segment from 6:21 to 7:01 for those with limited time. Connery's words so simply and so brilliantly capture the transformative power of reading. The transcript of those 40 seconds appears below. Sean Connery: I got my break—big break—when I was five years old, and it's taken me more than seventy years to realize it. You see, at five, I learned to read. It's that simple, and it's that profound. I left school at thirteen, I didn't have a formal education, and I believe I would not be standing here tonight without the books, the plays, the scripts. Adults: Tell children this truth and live by it yourself. A quick, easy, and inexpensive way to learn about writing these days is through webinars. I have designed and delivered synchronous and asynchronous online writing courses, webinars, or coaching programs for eight companies, which have made the content available only to their staff. But 14 of my one- to two-hour webinars and 4 live online courses for six other firms are online, all for free or at reasonable prices. How to Write a Darn Good Email – Target your audience, get to the point, and develop a professional email style. How to Write Fast When It's Due Yesterday – Manage high-pressure writing situations in all kinds of environments under tight time pressure. Business Writing Workshop – Streamline your writing process by focusing on what to write and how to write. Effective Technical Writing – Recognize audience needs, organize information, and craft succinct summaries. Business Grammar Workshop – Use the standard rules of grammar as well as the exceptions that business dictates. Writing for the Web – Write online content, including marketing emails, website pages, blog posts, and tweets. Writing an Effective and Efficient Email – Master the unique challenges of email by composing reader-centered messages and creating a professional tone. Technical Writing Essentials – Convey your expertise through purposeful content and a strong style to reach expert and non-expert audiences. Business Writing for Financial Professionals – Determine the appropriate level of detail, structure content for easy reader access, and heighten the relevance of facts. Quality Writing for Technical Professionals (premieres March 11, 2014) – Strike a balance between conveying complex data to subject-matter experts and less technical readers. Report Writing for Auditing Professionals (premieres April 23, 2014) – Present criteria, conditions, causes, and effects with authority. Writing Effective and Efficient Email – Recognize five common email problems and identify the standards of an excellent email. Audit Report Writing – Create department-specific templates, cultivate a clear and concise vocabulary, and use syntax and diction tips. Writing for Engineers – Determine content and style for diverse audiences, standardize documentation tasks, and summarize effectively. Financial Business Writing – Organize messages with a practical structure, link key business points with logical transitions, and cultivate a fluent style. Emails: Writing Them Right – Employ a strategy for writing email effectively. Audit Report Writing (premieres July 14, 2014) –Employ a vast toolbox of techniques when noting observations, drafting objective workpapers, and composing structured, comprehensive, and fluent audit reports. Writing Effective Email: Mastering Today's Number One Tool for Business Communication – Craft clear, concise, actionable emails for business success.